New friends Margot and Mateo discover an invasion of slug-like aliens that have taken over the minds of most of the adults in their town. Now, they must do what they can to stop them and SAVE THE WORLD! A hilarious—and slimy—alien adventure (set on Earth) that the bestselling author of Zombie Chasers, John Kloepfer, calls "fast paced, out-of-this-world fun!" When Margot Blumenthal removes a bright blue slug alien attached to Mateo Flores’s back, the school play co-stars know it’s definitely not going to be a regular day at West Cove Middle School. They reluctantly team up and soon discover that the mayor and countless other adults, including Mateo’s dad, are infected—which means that West Cove, and possibly all of Earth, is in danger. What will they (and their new scientist friend) do? Ditch class and protect humankind, of course—because one unexcused absence doesn’t matter when the world is at stake! 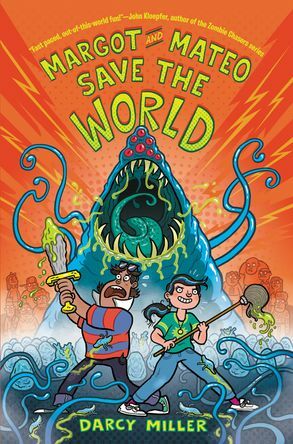 This stand-alone middle grade novel is fun, silly, and full of adventure. Young readers will speed through it…if they can stop laughing long enough to turn the page.